Computer-based lie detectors are in the Homeland Security budget this year. A $3.5 million grant has been given to Rutgers scientists led by Dimitris Metaxas, director at the Center of Compuational Biomedicine Imaging and Modeling. 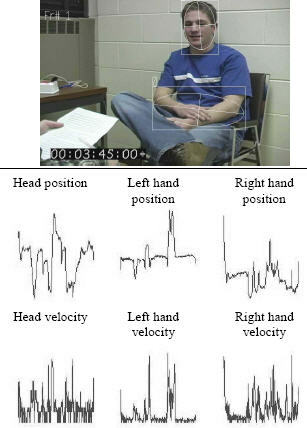 They are researching how body movements, such as shoulder shrugs, hand gestures or slight changes in facial expression, may indicate that a subject is lying. The system will capture these images digitally, and have the computer provide real-time feedback on whether a subject is telling the truth. It is hoped that by tracking the faces and hands of an individual, objective behavioral indicators of deception can be isolated, extracted and synthesized - accurately detecting human deception. "Blob analysis" refers to using computer systems to picture essential elements (hands and faces) and track them. 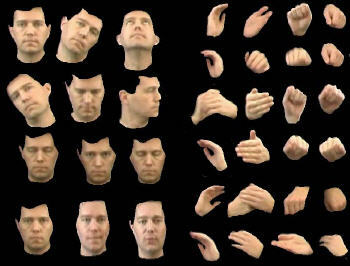 After extracting the hand and face regions from an image sequence, the system computes elliptical "blobs" identifying candidates for the face and hands. From the blobs, the left hand, right hand and face can be continuously tracked throughout a session. From positions and movements of the hands and face further inferences about the torso and the relation of each body part to other people and objects can be made. This allows the identification of gestures, posture and other body expressions. Two theories guide the development of automated systems for detecting deception through identifying agitated and controlled behavior - Interpersonal Deception Theory (IDT) and Expectancy Violations Theory (EVT). IDT states that deception is a dynamic process. Deception is portrayed as a game of moves and countermoves where the deceiver adjusts the message in response to the perceived trust or suspicion of the receiver. EVT is concerned with what nonverbal and verbal behavior patterns are considered normal or expected, what behaviors constitute violations of expectations, and what consequences violations create. The modern lie detector was invented by Dr. William M. Marston in 1917. The machine was also called a polygraph - literally "many writings", referring to the method of recording several physiological responses at the same time. He also wrote under the pen name Charles Moulton - creating the Wonder Woman comic strip. Wonder Woman, as you may recall, had a magic lasso that caused anyone she caught with it to tell the absolute truth. Read more at ZDnet and in this paper - Blob Analysis of the Head and Hands: A Method for Deception Detection.